Lynn represented the United States at the 1971 Pan American Games, where he won a silver medal. After graduation from USC, Lynn started his career for the Red Sox with a 1975 season in which he won the Most Valuable Player and Rookie of the Year awards, the first player to win both in the same season. (The feat was duplicated by then-Seattle Mariners right fielder Ichiro Suzuki in 2001.) Lynn and fellow rookie outfielder Jim Rice were dubbed as the "Gold Dust Twins". In 1975, Lynn led the American League in doubles, runs scored and slugging percentage, finished second in the batting race with a .331 average, and won a Gold Glove Award for his defensive play. On June 18 at Tiger Stadium, he hit three home runs, had 10 RBI, and 16 total bases in one game. Fred Lynn's career was hampered by some injuries caused by fearless play, such as a broken rib from crashing into an outfield wall, or knee injuries from breaking up double plays,and playing all out defensively. Lynn won three more Gold Gloves in 1978-80 and finished fourth in the 1979 MVP voting; he won the AL Batting title in that same year. ( 1979) while being elected to the All-Star team every year with the Red Sox, and nine time All Star over his career. He hit a home run in three All-Star games for the Red Sox, in 1976, 1979, and 1980 and hit the only grand slam in All-Star history in 1983. Following the 1984 season, Lynn signed with the Orioles, who signed numerous free agents in the mid-1980s in an ultimately unsuccessful effort to win another World Series after their 1983 title. Lynn never played more than 150 games in a season and only topped 140 games four times. From 1982–1988, his home run totals were 21-22-23-23-23-23-25. His four consecutive years with exactly 23 home runs tied Ken Boyer (24 each year for Cardinals from 1961–1964) for most consecutive years with exactly the same number of home runs (based on 20 or more home runs); Adam Dunn later matched this mark with 40 each year from 2005–2008. 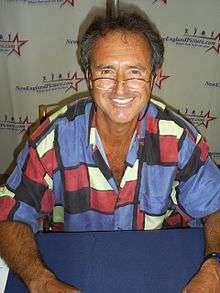 Fred Lynn resides in Carlsbad, California with his wife, Natalie. Fred has two children from his first marriage. Jason Lynn who resides in Tustin, California with wife Bethany and son Carter. Jenny Lynn who resides in Fort Smith, Arkansas with sons Tyler and Hayden. His younger brother is California attorney Jonathan Lynn. ↑ "1971 Pan American Games (Rosters)". Baseball-Reference.com. Sports Reference, LLC. Retrieved July 25, 2016. ↑ During his lengthy major league career, Lynn played for five different teams, but considers himself a member of the Red Sox family. "I'm a Red Sock. I didn't want to leave the Red Sox", said Lynn, who was traded to the California Angels in January 1981. "I came up with them and from 1973 to 1980 I was their property. I thought I'd end up spending my entire career in Boston. It was tough, even though I was going to a great team and playing for a great owner in Gene Autry." ↑ Los Angeles Times, August 19, 2012, page C5, "Fred Lynn's Cautionary Tale"
Wikimedia Commons has media related to Fred Lynn.